I’m Central Precinct Property Crimes Detective Alex Clark. Newport News Police need your help to solve a case of Larceny. January 20, 2017 at about 4:20 PM a man and woman entered a local department store in the 12000 block of Jefferson Ave. Inside they worked together to steal store merchandise. We need your help to identify this man and woman and bring them to justice. The couple went to the children’s section of the store, selected a box containing boots then went to clearance section of the store. Surveillance video shows the couple open the box, remove the contents and the female place the merchandise into her shoulder bag. The man then pushed the empty box under the clearance rack. Both then left the store. (1-888-562-5887). Remember, Crime Line callers may remain totally anonymous, are never required to testify in court and could be eligible for a cash reward if their information leads to an arrest. For the Newport News Crime Line I’m Detective Alex Clark. I’m Assistant Public Information Officer, MPO Brandon Maynard. The Newport News Police need your help to solve a recent larceny of cash. On January 12th, 2017 at approximately 12:30 PM, a Walmart employee was cashing her paycheck at the cash center inside the Walmart when she accidentally left her envelope on the counter. The female left the cash center and walked over to a nearby nail store, and realized that she didn’t have the envelope with the money when she was paying for her nail services. The female was able to retrieve the security footage from the Loss Prevention Office, and observed a black female that she remembers was in line behind her taking the envelope containing $500 off the counter and leaving the Walmart. The offender was described as a black female and in her 30’s. If you know anything about this larceny or the person responsible, call the Crime Line at 1-888-LOCK-U-UP (1-888-562-5887). Remember, Crime Line callers may remain totally anonymous, are never required to testify in court and could be eligible for a cash reward if their information leads to an arrest. For the Newport News Crime Line I’m MPO Brandon Maynard. I’m Master Police Officer Brandon Maynard. Newport News Police need your help to solve a case of homicide. On January 3, 2017 at about 8:00 PM police responded to the 800 block of Sundown Lane in reference to a report of shots fired. Arriving officers observed several vehicles struck by gunfire and after a search, a male victim lying near the front door of an apartment. At 8:20 PM Fire Department Medics pronounced the man deceased. We need your help to solve this shooting and homicide. The victim was identified as 30 year old Roy Markey Jackson of Newport News. Mr. Jackson was visiting the apartment complex when he was shot retrieving items from a parked vehicle. After being struck by multiple rounds of gunfire Mr. Jackson managed to get to the front door of an apartment before collapsing. To date there is no suspect information in this shooting. A white SUV was seen leaving the area at the time of the reported gunfire. Newport News Police need your help to solve a case of larceny and credit card fraud. On October 18, 2016 at 11:30 am a 62 year old Newport News man informed police that some unknown person(s) removed his credit card from his wallet on October 14, 2016 and used it to make unauthorized purchases. We need your help to solve this case of theft and credit card fraud. The victim advised he was working out at a local fitness center on 10/14/16. During the work out he had locked his wallet and other personal items in a locker. After the workout he found the lock securing the locker broken and a single credit card missing from his wallet. All other property was present. Before the card could be cancelled the victim was notified of what was later determined to be unauthorized card usage. Surveillance video showed an unknown man use the card to make purchases at local department stores in Newport News and York County. 1-888-LOCK-U-UP (1-888-562-5887). Remember, Crime Line callers may remain totally anonymous, are never required to testify in court and could be eligible for a cash reward if their information leads to an arrest. Newport News Police need your help to solve a home invasion robbery and vehicle theft. On October15, 2016 at 10:15 pm Newport News police officers were dispatched to the 800 block of Roam Ct. in reference to a robbery. Upon arrival they met three victims who stated they were robbed and their car taken. We need your help to solve this violent crime and bring the guilty to justice. The victim in the driver seat stated she pulled into a parking space and an unknown black male knocked on the window asking for spare change. The man then produced a handgun and demanded money. At the same time a second black male approached the passenger side front window. He also produced a firearm and ordered the front seat passenger out of the vehicle. During the robbery all three victims were ordered out of the vehicle and placed on the ground while the suspects rummaged through their belongings throwing everything out of the vehicle except credit cards. The suspects then fled the scene in the victim’s vehicle, a 2011 Ford Focus, last seen traveling southbound on Marshall Ave. There were no injuries reported and there is no suspect description. This carjacking/robbery remains under investigation. If you know anything about the men responsible for this robbery and carjacking call Crime Line at 1-888-LOCK-U-UP (1-888-562-5887). Remember, Crime Line callers may remain totally anonymous, are never required to testify in court and could be eligible for a cash reward if their information leads to an arrest. Information can also be sent by text message to nocrime@nnva.gov For the Newport News Crime Line I’m Officer Brandon Maynard. I’m Central Precinct Assistant Public Information Officer Brandon Maynard. Newport News Police need your help to solve a recent bank robbery. 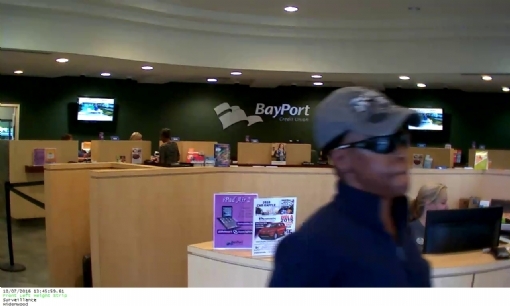 On October 7, 2016 at 1:47 PM Central Precinct officers responded to the Bayport Credit Union, located at 12512 Warwick Boulevard, in reference to a bank robbery. An unknown woman entered the bank and walked up to a teller. She presented a note saying that she had a gun and demanded cash. We need your help to identify this woman and bring her to justice. The suspect grabbed money from the teller and put it into the black canvass bag she carried then walked out of the Credit Union. As she fled the area the bank dye pack exploded in the bag. The suspect was described as a dark skinned black female, approximately 5’5”-5’7” in height, wearing a dark colored long sleeve shirt, baseball cap, sunglasses, and light colored blue jeans. The suspect ran away through the wooded area near the bank. (1-888-562-5887). Remember, Crime Line callers may remain totally anonymous, are never required to testify in court and could be eligible for a cash reward if their information leads to an arrest. Information can also be sent by text message to nocrime@nnva.gov For the Newport News Crime Line I’m Officer Brandon Maynard. I’m Master Police Officer and Public Information Officer Holly McPherson. Newport News Police need your help to locate to solve a burglary resulting in robbery. On Saturday, June 25, 2016 between 5:00 and 5:30 am and unknown man broke into a home in the 1000 block of 72nd Street to commit a burglary then robbed the 78 year old resident he found inside. We need your help solve the burglary and robbery and arrest the man responsible. The victim was asleep in the home when she woke up to a noise from the kitchen. She then saw the figure of a man in the hallway. The man grabbed her and demanded money. After giving him cash the man forced her to her bedroom, demanding her jewelry. The man then forced into the bathroom and ordered her not to come out. The man then fled the home. Based on his voice the suspect is described as a white male about 6’ foot tall with a medium build; bald; wearing dark clothing, with a scarf over his face and very well spoken. If you know anything about this burglary and robbery incident or the man responsible call the Crime Line at 1-888-LOCK-U-UP (1-888-562-5887). Remember, Crime Line callers may remain totally anonymous, are never required to testify in court and could be eligible for a cash reward if their information leads to an arrest. Information can also be sent by text message to nocrime@nnva.gov For the Newport News Crime Line I’m MPO Holly McPherson. I’m City of Newport News 311 Contact Center Customer Service Assistant Leslie Baker. Newport News Police need your help to solve a recent business robbery. On April 25, 2016 at 11:46pm, police responded to 7Eleven, located at 12460 Warwick Boulevard, in reference to a business robbery. 7Eleven employees advised that a black male, wearing all black clothing, black mask covering his face, entered the business with a handgun and demanded cash. We need your help to solve this armed business robbery and bring the guilty to justice. The suspect was described as approximately 6’0 tall, heavy set, armed with a silver large framed semi-automatic handgun. The employees complied with the suspect’s demands and the man took the entire till from the register and fled on foot in an unknown direction with an unknown amount of money. No injuries were reported. If you know anything about this business robbery or the man responsible, call Crime Line at 1-888-LOCK-U-UP (1-888-562-5887). Remember, Crime Line callers may remain totally anonymous, are never required to testify in court and could be eligible for a cash reward if their information leads to an arrest. Information can also be sent by text message to nocrime@nnva.gov For the Newport News Crime Line I’m Leslie Baker. I’m Central Precinct Officer Ariel Pagan. Newport News Police need your help to solve a recent case homicide. received a call of a shooting in the 1200 block of 25th Street. Responding officers found two male victims. One man was pronounced deceased at the scene the second was transported to a local area hospital suffering life threatening injuries. We need your help to solve this shooting / homicide and bring the guilty to justice. The deceased victim is 37 year old Lavelle Singleton of the 1100 block of 34th Street in Newport News. The only suspect information indicated an unknown black male was seen running from the scene after the gunfire. I’m Major Crimes Robbery Detective Allison Erickson. Newport News Police need your help to solve a shooting and attempted robbery. of a shooting and robbery victim at the Hampton Sentara Careplex. The victim, a female Hampton resident, sustained two gunshot wounds while in the Newport News Newsome Park area. We need your help to solve this attempted robbery and aggravated assault and remove the offender from our streets. an unknown male approached her from the passenger side door and demanded money. As the victim backed up to flee, the subject opened fire striking her in the right wrist and the left upper thigh. The victim was able to drive herself home and was transported by family to the Hampton Careplex. The only suspect description is that the offender sounded like a young black male. Newport News Police need your help to solve a business robbery. 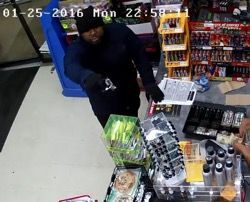 On January 25, 2016, just before 11:00 p.m., an unknown man entered the Hop N Shop convenience store located at 12961 Jefferson Avenue. The man produced a handgun and demanded money. We need your help to identify this man and bring him to justice. Four employees were held at gunpoint during the robbery. No one was injured. Once the suspect got the cash he fled the business running across Jefferson Avenue. 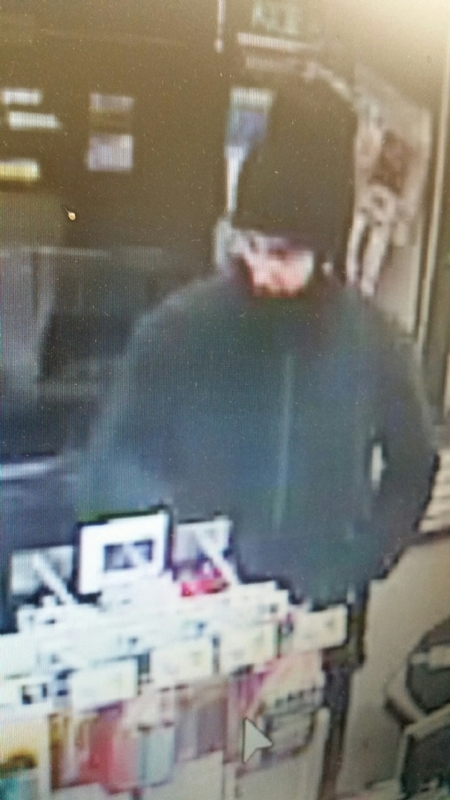 Suspect description: B/M, 25-35 years old 5’5”-5’8” in height, with a medium build, dressed in a blue hoodie, black pants, black shoes, black knit cap, and black gloves. Newport News Police need your help to solve a recent bank robbery. On Saturday April 16, 2016 at 11:54 am an unknown man entered the Wells Fargo Bank located at 11006 Warwick Boulevard and threatened to harm the bank employees if he wasn’t given cash. We need your help to identify this man and bring him to justice. The employees complied and the man exited the business with cash placed in a bag he supplied. The man was observed entering a dark blue 2007-2008 Camry which fled northbound on Warwick Blvd. SUSPECT: Black male, 6’1”-6’3”, 215-220 pounds, dark complexion, wearing a faded green cap, white surgical mask, white t-shirt, dark-colored hooded jacket with light-colored lining, white t-shirt, blue jeans and white sneakers; last seen carrying a Nextel gray and black backpack. If you know anything about this bank robbery call Crime Line at 1-888-LOCK-U-UP (1-888-562-5887). Remember, Crime Line callers may remain totally anonymous, are never required to testify in court and could be eligible for a cash reward if their information leads to an arrest. Information can also be sent by text message to nocrime@nnva.gov For the Newport News Crime Line I’m MPO Donald Watt. I’m Assistant Public Information Officer Brandon Maynard. Newport News Police need your help to identify a man in a vehicle theft. On February 15, 2016, at 6:25 pm police were flagged down by a citizen at the Citgo Gas Station at 1502 27th Street, in reference to a larceny that occurred by the gas pumps. The victim, a 40 year old Hampton woman, advised she went into the gas station and returned to find her purse missing from her car parked at the pumps. Personal items, cash, two cell phones and credit cards were missing. The investigation produced a photo of an individual (possible witness) to the theft. If you recognize this individual or know anything about this theft from vehicle call Crime Line at 1-888-LOCK-U-UP (1-888-562-5887). Remember, Crime Line callers may remain totally anonymous, are never required to testify in court and could be eligible for a cash reward if their information leads to an arrest. Information can also be sent by text message to nocrime@nnva.gov For the Newport News Crime Line I’m Officer Brandon Maynard. I’m Central Precinct Police Aide Kurt Jones. Newport News Police need your help to solve a recent business burglary. On March 18 2016 at about 6:00 am officers were dispatched to 10725 Jefferson Ave., the Hot Dog King, in reference to a burglary alarm. We need your help to solve this business burglary and bring the guilty to justice. A side door to the business was broken open with a large cinder block. All other doors to the business were secure. When the key holder arrived officers were able to clear the rest of the building. One of the cash registers by the front door was broken into. The bottom half was broken open and the top half was taken. Nothing else was taken or destroyed. The business was all locked up and the security alarm was set at the time of the burglary. There is no suspect information in this burglary. I’m North Precinct Sergeant Karen Allen. Newport News Police need your help to solve a recent business robbery. On February 22, 2016 at 7:52 pm Police Communications received a call in reference to a business robbery at the Dollar General, located at 17413 Warwick Boulevard. Police need your help to solve this armed business robbery and bring the guilty to justice. An armed a white male entered the business, produced a handgun and demanded money from the register. At the time of the robbery, there were 2 employees and 2 customers present. No one was injured. The suspect was described as a white male, approximately 6’0, thin build, wearing a black zip up jacket or hoodie, black skull cap, black winter mask covering his face and nose, dark colored jeans, and a large frame black gun. He obtained cash and calmly walked out of the business. Newport News Police need your help to solve a cold case homicide. On January 20, 2013 at 10:39 pm police responded to 2OO block of North Maple Court in Newport News in in reference to a shooting. On scene officers located a black male, later identified as Ajene Tylik Marrow, lying on his stomach at the front door of the residence. Medics arrived and transported Mr. Marrow to Riverside Regional Medical Center where he was pronounced deceased at 11:10 PM. According to witnesses a gold colored Nissan with a loud muffler and temporary tags drove past the residence then backed up as Mr. Marrow was exiting his vehicle. Two unknown men approached Mr. Marrow, a fight began and one gunshot was heard. The men left the scene and Mr. Marrow collapsed on the front porch. To date no one has been charged in this murder. If you know anything about this shooting resulting in the death of Ajene Tylik Marrow call Crime Line at 1-888-LOCK-U-UP (1-888-562-5887). Remember, Crime Line callers may remain totally anonymous, are never required to testify in court and could be eligible for a cash reward if their information leads to an arrest. Information can also be sent by text message to nocrime@nnva.gov For the Newport News Crime Line I’m Officer Brandon Maynard. Newport News Police need your help to solve a recent business robbery. On Tuesday, February 9, 2016 just before 9:00 p.m., two black males armed with firearms entered AT&T at 12080 Jefferson Avenue. The suspects demanded money and cell phones from the two store employees and fled the store once the items were obtained. I’m Major Crimes Robbery Unit Detective Allison Erickson. Newport News Police need your help to solve a business robbery. If you recognize this man or know anything about this robbery from business call Crime Line at 1-888-LOCK-U-UP (1-888-562-5887). Remember, Crime Line callers may remain totally anonymous, are never required to testify in court and could be eligible for a cash reward if their information leads to an arrest. Information can also be sent by text message to nocrime@nnva.gov For the Newport News Crime Line I’m Detective Allison Erickson.